Download the FREE trial of the APP in the Play store or App store and enjoy some skills and fills! Download the whole content and get access to over 60 tough drum fills for only € 6,99. The Skills & Fills E-book is now available in the App and Play store! The drum book Skills & Fills has first been published in Holland and it became a great succes. 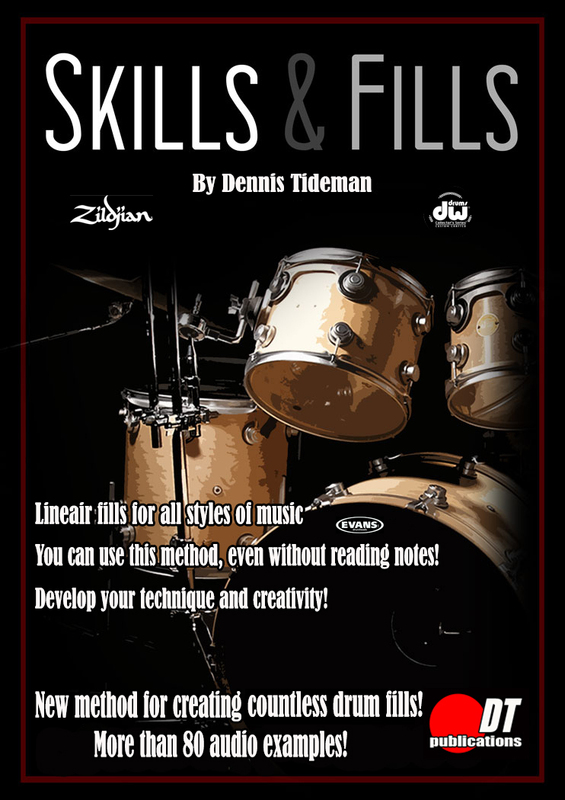 It’s written by Dennis Tideman who runs a drum school (Drumschool DT) for 20 years now. After years of giving drum lessons he came up with this drum book that is all about developing drum fills. The system that is presented in the book is accessible for a large group of drummers from amateur to pro. A lot of drum teachers in Holland use this book for their students, because playing fills is a very nice way to develop technique and rudimental capabilities. Also the individual creativity will be teased by using this system! Besides the more than 80 examples of tough linear* drum fills that are demonstrated with the audio files that come with the book, there is the unique Fill Generator, which gives you many possibilities to create your own drum fills! Download the E-book now in the App store or in the Play store! It’s highly recommended to use the Drum APP besides the book, for an even more inspiring drum experience, but both the Book and Drum App are very useful on its own as well..
* Linear drum fills incorporate stickings that usually don’t overlap each other. This is why linear drum fills and grooves always sound very open and clear!